This recipe created masterfully by Jordan. 1. Liberally salt and pepper both sides of roast. If you have time, wait a bit for the salt to get into the meat, about 30 minutes. No big deal if you can’t. 2. Sear the roast on both sides in frying pan on medium-high heat with olive oil. (It doesn’t keep the moisture in, but it does make a nice brown “crust.”) After the roast is nice and brown on all sides, place it into the slow cooker. 4. Do the same with the mushrooms and onions. Cook ’em a little in the tasty juice, and then place into the slow cooker. 5. Liberally salt and pepper the ingredients in the slow cooker. You can also add the garlic powder and oregano at this time. 6. Pour about 3/4 of the bottle of wine into the slow cooker. Save the remaining 1/4 to apply to the cook as needed. 7. Cook for at least 8 hours, covered, on the low or very low setting. The longer, the better. Keep an eye on the slow cooker every so often – even on low settings it will tend to boil – just crack the lid open to cool it off if you see this. Again, don’t fret over it. 8. Kiss the cook (Lauren’s suggestion). 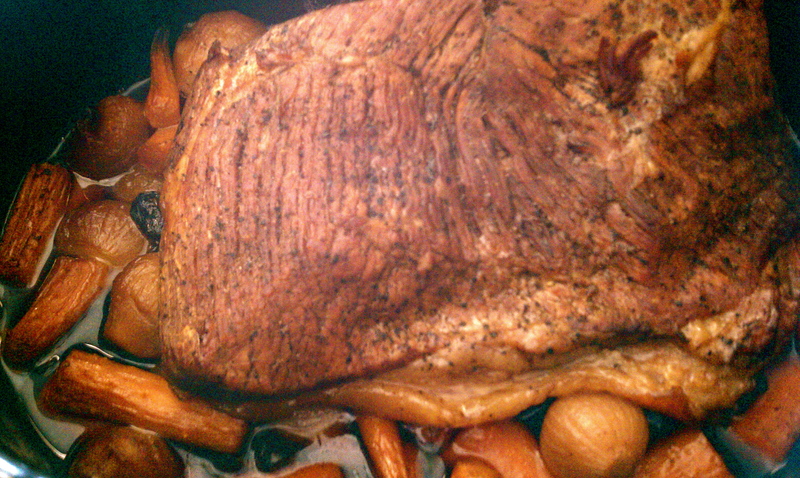 A pot roast is a wonderful thing, and a pot roast recipe is delightfully flexible. Want a different vegetable? Cool. You’d rather use stock instead of wine? Fine. Adapt it however you see fit – all you need is the meat, something to cook it in and something to cook it with!